How To Do The Facebook Trick On Omegle? If you would like to do tricks and jokes your partners on Omegle. We are going to tell you an old trick in this article. I hope you are going to enjoy with this trick on Omegle. It’s very old trick but still some people don’t know about it at all. If you want your partner to be suspucious about yourself. It will be still a good option. So how to do the Facebook trick on Omegle? It’s very easy. 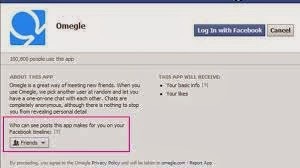 Just connect to Omegle’s chat services and begin to talk with your partner. Get some usual information from your partner. Doing Facebook Trick on Omegle! May be name, location, age and gender. Then send an url to him or her. This url can be sent to your victim: “http://www.Facebook.com/profile.php?=43423453”. He will see his own facebook page with in this url and he is going to be very surprised. He or She is going to be curious that how come you know about him or her and you are going to enjoy while you speak with him / her.